The First Amendment’s freedom of speech guarantee remains a hot topic in the courts. The First Amendment lawyers at Famighetti & Weinick PLLC handle First Amendment cases ranging from employment retaliation to retaliation against private citizens. 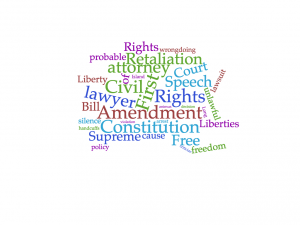 Today’s Long Island civil rights blog discusses retaliatory arrests and the effects of government officials censoring speech. The Constitution has limits. The First Amendment is not unlimited and neither is the Fourth Amendment. For instance, the Fourth Amendment places limits on a police officer’s arrest power. Specifically, the Fourth Amendment requires police officers to have probable cause before making an arrest, meaning a reasonable belief that a crime has been committed. Otherwise, the arrest is unlawful. Establishing probable cause, however, is easy and police officers are given a significant amount of discretion and deference when it comes to arrests. On June 18, 2018 in Lozman v. Riviera Beach, the question before the U.S. Supreme Court was whether the existence of probable cause prevented an individual from suing for retaliatory arrest. Lozman was an outspoken Florida resident who often opposed and criticized his city council’s policies, practices, and laws. The city first encountered Lozman when he criticized the city’s new law affecting his boat home resulting in him filing a lawsuit against the city. At issue in Lozman’s current case was an incident that occurred in 2006, during his attendance at a public city council meeting, when Lozman criticized the city’s alleged corrupt practices. A city councilmember frustrated with Lozman’s comment, requested that he step off the podium and stop talking, but Lozman refused. Video taken of the incident shows Lozman standing at the podium for about 15 seconds and talking in a calm voice, when suddenly, a council member ordered a police officer to “carry [Lozman] out.” A police officer complied with the council member’s request, placed Lozman in handcuffs, and escorted him out of the public city council meeting. Lozman was subsequently charged with disorderly conduct and resisting arrest without violence. The prosecution ultimately dropped the charges against him. Shortly thereafter, Lozman, again, sued the city. In this suit, Lozman conceded that probable cause existed for his arrest, but he argued that it was something else that actually caused his arrest. Lozman argued that the city was fed up with him due to his prior lawsuit, constant criticism, and his conversations at public city meetings regarding the city’s corrupt practices. Thus, Lozman argued that the council member wrongfully and arbitrarily requested the officer to arrest him just to silence him. Further, Lozman argued that this was often done by the City and was therefore the city’s “official municipal policy” that led to his arrest. Thus, according to Lozman, it was not the police officer that Lozman accused of wrongdoing, but the city council member. The issue before the Supreme Court was whether Lozman’s arrest violated the First Amendment because the arrest was made in retaliation for his earlier protected speech. Writing for the majority of the Court, Justice Kennedy noted that engaging in political speech is “one of the most precious of the liberties safeguarded by the Bill of Rights.” The Court concluded that whether or not probable cause existed did not matter and Lozman did not have to prove the absence of probable cause. Where, as here, a plaintiff could show sufficient evidence that the arrest was caused by a “substantial or motivating factor” to retaliate, the defendant could win only by showing that the arrest would have still occurred, regardless of whether or not it was motivated by a retaliatory animus. The Long Island First Amendment lawyers of Famighetti & Weinick PLLC are available to discuss free speech cases including retaliatory arrest lawsuits, free speech retaliation, and other First Amendment violations. Contact a Long Island civil rights lawyer at 631-352-0050 or visit us on the web at http://linycemploymentlaw.com. Today’s Long Island civil rights blog was written by law clerk and Hofstra law school student Thalia Olaya.